When there's a winning side, there's also a losing side. People; often look for the winners and their reactions and their winning speech. And so a few look at the person who has lost. The group had read vastly, negotiated wisely and learned widely. They were prepared for their debate competition. They thoroughly studied the current topics going on around the country and also on the international level. They also read the possible debates held earlier. The moment came when the judge came in. Theirs was team A and their opponents were team B. The judge revealed the topic which was, 'Ban on animal testing.' After the coin was flipped, Team A got 'Against'. On moral grounds, anyone would have wanted 'For'. that was the first downfall. 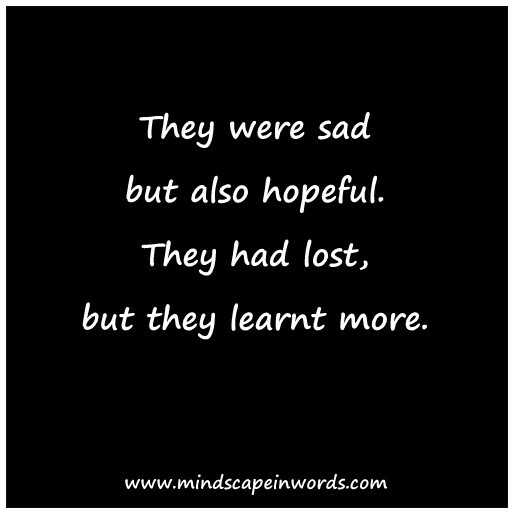 But they didn't lose hope. Their brain started working and thinking about valid points for the argument. They knew about the odds and had planned on such topics as well. Soon the discussion began. Even when fate was not on their side, they had made some brilliant points and given excellent examples. Time passed and soon the scheduled hour was over. The teams were waiting for the results. Unfortunately, they lost. They were so dejected that it was hard to take it all in. Everyone cheered for the winners, but no one gave as much as a second glance to them. No one asked them how they felt or congratulated them for their effort. The other team praised them now, but they didn't feel it real. It was the worst feeling in the whole world. At that moment, they felt smaller than they had ever felt. At that moment, even though they had lost, they promised themselves to do better. They promised to study harder and not lose hope. In that moment, they were sad but also hopeful. They had lost, but they learnt more. Failing is not something that I like. I dont think anyone wants to feel it as well, but as you said if there is a winner, there is also that person / group that didn't make it to the cut. While it could be disheartening, there will always be life lessons to take in any failure. There will definitely be other chances for people to come out as winners. It's important though to still be graceful even the face of failure.